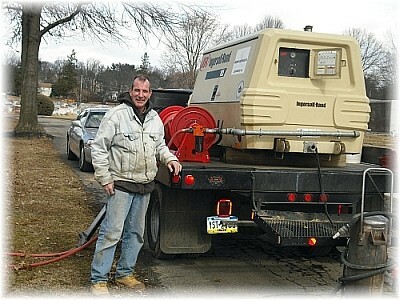 To prepare for an exact quote, we visit the site prior to doing any permanent work. During our visit we make a "rub" of the existing lettering so we can match the font, style, layout and size. We also confirm exactly, down to the last letter, the size and content of the proposed inscription. Additionally we measure and photograph the existing monument. Then we prepare and communicate our cost, not an estimate, to you for the inscription. There is no obligation for any of the preceding steps. These steps are meant to insure against inaccuracies or unpleasant miscommunications. This part of our pre-production routine culminates with an exact quote, sent to you in writing!! Every Inscription is done on-site, without disturbing the existing monument. In order to do this we need to send high powered, heavy, expensive equipment to the site of your existing monument along with a skilled lettering expert to accomplish each inscription. Once you have accepted our quote, a stencil is made from a rubberish material that fits on the stone where the inscription is to be done. The custom stencil will be used by high-pressure sand blasting equipment for accuracy and spacing. 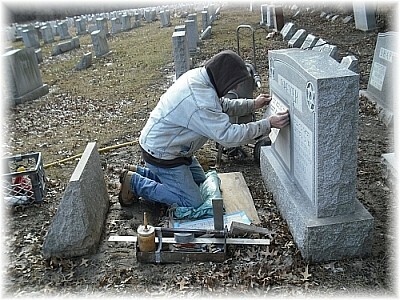 The skilled cemetery lettering expert (and his fully equipped truck) visits the site, finds the correct stone, checks the lettering and measurements, then gets down to work. Our process is a lengthy one, but it assures satisfaction and accuracy on every level!! 1) There is no obligation as we gather information. 2) You receive a free quote based on your input, and our photos and measurements from the existing stone monument. 3) Once our quote is accepted, we guarantee accuracy and satisfaction. 4) We make an accurate inscription and we guarantee the result. To help you with the permanent memorialization of your recently passed loved one, simply fill out the form on the right of this page.